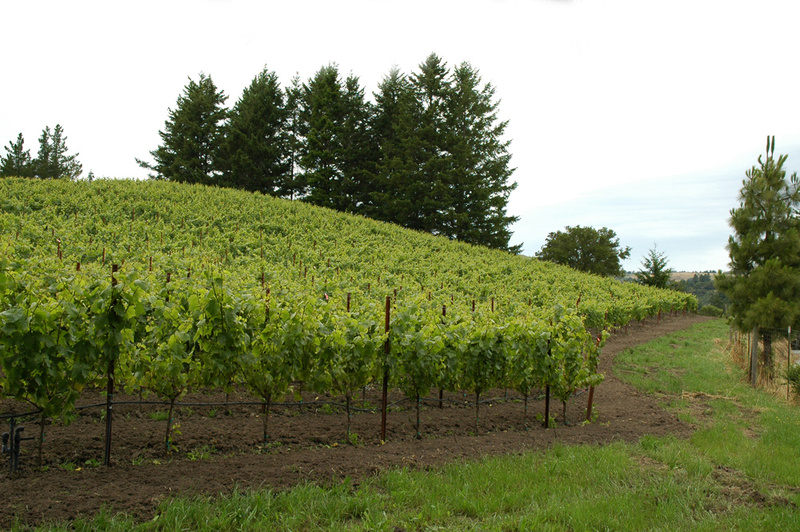 Welcome to the Fall 2013 newsletter from Rhys Vineyards! While many of our past newsletters have focused on Pinot Noir, we thought it might be a good time to give Chardonnay a moment in the spotlight. We quickly realized the incredible potential for Chardonnay at our ocean-facing Santa Cruz Mountain sites after tasting our first (unreleased) Alpine Chardonnay in 2003, and we have steadily increased our Chardonnay plantings ever since. Starting with only a single acre at Alpine Vineyard, our Chardonnay acreage has grown to a current total of 2.75 acres at Alpine, 4 acres at Horseshoe and 8 more acres at our Bearwallow vineyard in the Anderson Valley. Often white wine grapes are given the “lesser” parcels within a vineyard, but our love of great Chardonnay has driven us to make sure that our Chardonnay vines have some of the best soils and exposures found at each site. Rhys’ philosophy for planting Chardonnay closely mirrors the way we have approached Pinot Noir. Each tightly spaced block is planted with low vigor rootstock onto which we have grafted a massale (or field mixture) of heritage selections of Chardonnay. The tight spacing forces the vines to fully explore the soil profile and produce very small berries while the mixture of Chardonnay selections contributes an orchestra of expressions. These attributes combine to deliver an intense and very complex bottle of Chardonnay. Chardonnay winemaking at Rhys is very “hands off” and traditional. Upon arrival at our cave, the grapes are gently and slowly whole cluster pressed (there is no crushing or de-stemming) for 4 hours. The must is then settled overnight and in the morning barrels are filled via gravity. In order to minimize oak flavors, only 20-25% of the oak barrels are new. The wine is then left undisturbed in cask, without any stirring or modifications, so that it can complete a native-yeast fermentation that sometimes takes an entire year. . 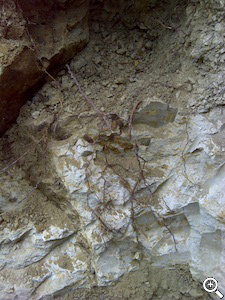 This chalky shale underlies our Ocean Block of Chardonnay. Our Horseshoe and Alpine vineyards provide a fantastic example of the role of soil expression in great Chardonnay. The two vineyards are just 500 yards apart and share the same climate, the vines used are of the same parentage and the winemaking is identical. However, the soils and geologies are very different which imparts a different character to each wine. 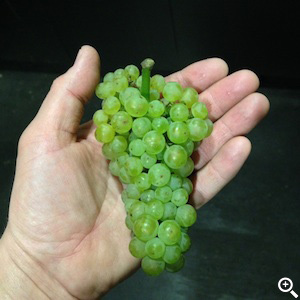 While they share many traits, both Chardonnays are powerful, complex and age-worthy. Alpine is typically more tightly wound with a distinctive ocean spray character. In contrast, Horseshoe Chardonnay offers wet rocks and jasmine on the nose with a long mineral driven finish. It can seem deceptively rich upon release but that character evolves to become quite precise and detailed with bottle age. Starting with the 2013 or 2014 vintage we will be adding a third Chardonnay from Bearwallow vineyard, but until then we hope you enjoy comparing the Alpine and Horseshoe! 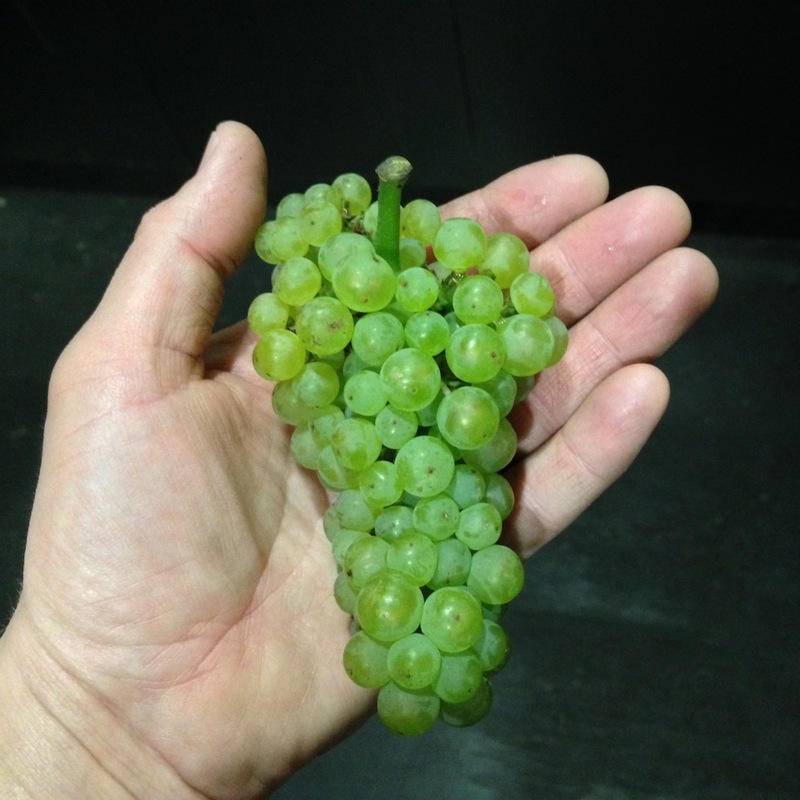 A typical small berried chardonnay cluster from Alpine vineyard. This Fall we are offering Alpine and Horseshoe wines from the very successful 2010 vintage. For a summary of the 2010 vintage conditions outlined in our Spring 2013 newsletter, please click here. The 2010 is an elegant, red fruited example of Pinot from this vineyard. The nose is quite complex and floral with forest floor notes. Like most Horseshoe Pinots this will need several years of cellar time. This wine shows the powerful side of Alpine. The primary and intense ripe black fruit is currently hiding the complexity that will emerge with bottle age. This can be opened now for the fruit or aged for the full experience. The beautiful ripe black cherry nose is highlighted by Swan Terrace’s trademark floral notes. Very complete, ripe and suave on the palate with excellent focusing acidity. Gorgeously complex nose of honeysuckle, jasmine and wet rocks. Very Intense on the palate with great acidity and a finely focused finish. This is tempting to open now but will be amazing in a few years. Each year we get more and more excited about Syrah from Horseshoe and with its intense aromatics of pepper and olive, the extremely savory 2010 sets a new benchmark. This is a fantastic example of the potential of really cool climate syrah in California. As usual, all wines are offered with free ground shipping and expedited shipping is available. Additionally, we will be hosting a pickup day at our Skyline cave on Sunday, November 3rd from 10AM – 3PM. We will be opening several of our 2011 wines, which is a great way to preview wines that will be released next year. If you would like to attend the pickup day, please be sure to select “Pick­­up at Winery” shipping option during checkout. We look forward to seeing you! 2011 was an extraordinarily cool and difficult vintage in California. The vintage conditions greatly reduced our production and unfortunately allocations will be very, very low. Rather then spreading such small quantities over two releases, we have decided to release all of our 2011 Rhys wines in the Spring 2014 offering. If you have any questions, please contact us at info@rhysvineyards.com and for more information about Rhys please visit our website at https://www.rhysvineyards.com.